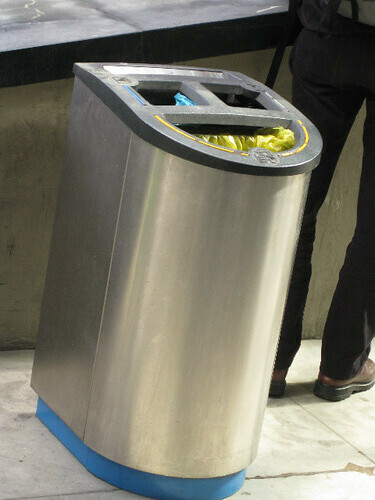 a proper trash can, originally uploaded by pinkyracer. recyclables in with your trash??? While the color coded bags might be meaningless to most people, there are little icons of what goes where, and one can peek into the bag to see what has gone before. Should all trash cans, particularly in public places, be like this? What could be done to improve this design? This one seems more obvious, with the shaped openings and color photos, but it’s overwhelming and quite hideous. If you’re going for any kind of ambiance other than “trash sorter” it misses the mark. But does it contain lessons for the first model? The first one was in the train station in Bilbao, the second one was sighted at the Barcelona airport. This entry is filed under Sustainability and tagged sustainability.